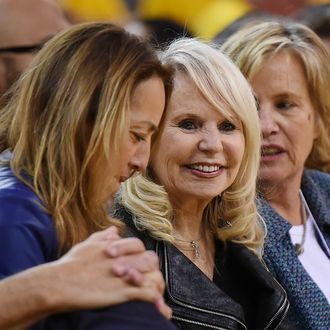 Bad news for Oprah, Magic Johnson, and all the other big names who reportedly want to buy the Los Angeles Clippers: Shelly Sterling isn’t interested in selling. Since NBA Commissioner Adam Silver specifically mentioned that his decision to impose a lifetime ban on noted bigot Donald Sterling doesn’t apply to his family members, her lawyer said on Thursday that she “has the same right as anyone else in America to enjoy and control the fruits of [her] labors, and that includes deciding whether to keep or sell her 50% interest in the team.” Shelly, who has owned the team with her husband for 33 years, “abhors” his racist comments, according to her lawyer, Pierce O’Donnell. “They may share the same name, but they don’t share the same values on race,” O’Donnell said. Shelly told the Los Angeles Times that she would like a new owner to replace her husband, allowing her to stay on as a passive owner. However, many say the Clippers can’t move past the debacle as long as someone by the name of Sterling is associated with the team.